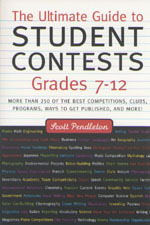 A free resource for students, teachers, parents, and contest organizers. $58,000 at stake. . .
. . . and just one student entered. Come on, people! Didn't anyone else hear about that contest? We're here to make sure you know about them all. Our student staff quizzes winners to learn their top tips. Your school newspaper can reprint these stories! Reviews by The New York Times, The Christian Science Monitor, etc. Care to correspond? Contact our assignment editor. International Student Media Festival * California Young Playwrights Contest * Arts Recognition Talent Search * The Presidential Scholars Program READ * Writing and Art Awards * MATHCOUNTS * Kid's Hall of Fame * Jabberwocky Poetry Contest and hundreds more!